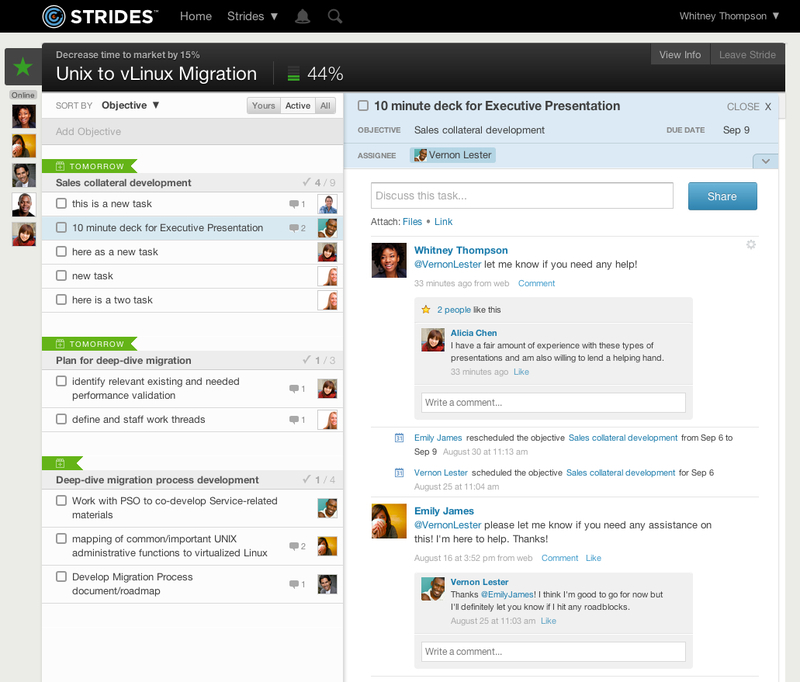 The Socialcast team at VMware (s vmw) has introduced a beta version of a new product called Strides, which aims to make task management an interactive experience. 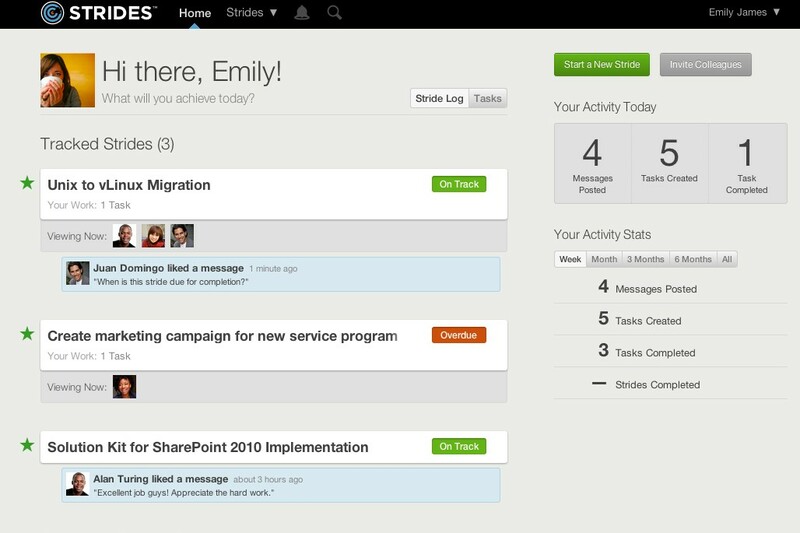 Think Basecamp, but more social, and with more visibility into what your colleagues are working on. Strides, of course, is just the latest venture of a new, more application-centric VMware. Strides lets people create tasks, invite participants, share files, monitor progress and all the other things one might expect from a project-management service, but it also takes it a step further. Users can see who else is online and working with a particular project at any given time, can exchange comments in real time and can filter by a variety of different characteristics. Young thinks Strides will particularly useful for large companies, inside of which it can be difficult to keep track of everything that’s going on. Department heads and managers, even C-level executives if they’re so inclined, will be able to get a broad view of what what their teams are working on and who’s doing what. And, of course, they can manage the tasks and interact with their employees, too. Although Strides and Socialcast are separate products, Young said the two ultimately will be integrated similar to how the various Google (s goog) applications are. Users will be able to open Strides from a link on their Socialcast pages, profile information will be shared between the two applications and, perhaps most importantly for users, Strides updates will appear in their Socialcast streams. Young views Strides as a move up the stack from Socialcast, which makes it an even higher step up for VMware, which just recently got into the application space. During VMworld, VMware CEO Paul Maritz talked a lot about applications replacing infrastructure in terms of strategic importance, and this approach has garnered many a comparison with Maritz’s previous employer, Microsoft (s msft). Young thinks that’s fair comparison, but noted that we’re talking about a different technology stack than in the previous generation, and users are part of the equation now, too. VMware is trying to bring the efficiencies it brought to computing resources to human resources, Young explained, which means that applications have to help IT shift from just managing devices to also managing people. VMWare is late to the game? My company http://www.binfire.com sole goal is to make project management social and collaborative, refer to the interview I did with Terri Griffith http://bit.ly/oO0yQe in these pages. Even when you are editing a task, you see who else has opened the same task. This is in addition to object staring to follow files and tasks and a host of other social feature.